Dozens of CUNY faculty and staff were arrested Wednesday after blocking an administration building to protest going five years without a labor contract. 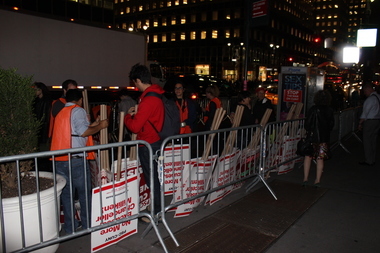 MURRAY HILL — About 50 CUNY faculty and staff members were arrested Wednesday after blockading the entrance to a CUNY administrative building in protest of going five years without a contract, according to organizers and police. Protesters wearing black T-shirts with the words “Five Years without a Contract Hurts CUNY Students,” were seen being handcuffed and led from the front of 205 E. 42nd St. Wednesday evening, video showed. “Tax the rich, not the poor, stop the war on CUNY,” protesters were heard chanting while blocking the entrance to the building, which houses the system’s human resources and administrative offices. Full-time and part-time faculty have been working without a contract since 2010, organizers said, and have not received a raise in six years. CUNY has offered the faculty and staff a contract through Oct. 19, 2016, with a six percent wage increase, according to a statement by the university system. "Since the expiration of the last contract, salary step increments were maintained at a total value of $45 million, equating to approximately 3 percent, and a historic agreement was reached on adjunct health insurance," the statement read. "The University looks forward to a successful resolution of contract negotiations and implementation of much-deserved increases for faculty and staff." Union organizers said the they decided to go ahead with the protest after receiving the offer, which they felt was too low. "The problem is that the offer is disastrous," said Barbara Bowen, President of CUNY Professional Staff Congress. "It's disastrous. It is way below the rate of inflation and doesn't come with anything else that would help the quality of education at CUNY." Bowen said she was "proud" of her members for taking a stand. "We are serious about this. We are not giving up. My emotions were pride, and, I have to say, anger," the union leader said, "that this university won't do the right thing for the students or for us."